*ALL race distances include a technical shirt, finishers' medal, post race refreshments, onsite EMS, award eligibility, aid stations, and a fun time! We'll be offering 5K, 10K, and 1/2 Marathon Distances. *All race distances are out and back courses starting and finishing at the EXIT of the Scenic Drive. * Since this is a race held on public lands the course is open to vehicular traffic. The course will be coned so as to allow us 1/4 of the roadway. Runners will be coming from both directions; please stay to your right, allow others to pass, and if running greater than single file it is up to you to make room for others to pass in either direction. PLEASE ask your spectators to keep their driving on course to a minimum. ** All runners are REQUIRED to wear a 360 degree reflective vest AND carry a handheld flashlight or wear a headlamp; glow-bracelets will be provided. A 360 degree reflective vest can be pre-purchased for $9 during the registration process and will be collected with your race packet. If you have one of your own you may wear that instead, but it must be a 360 degree reflective vest. Nathan Sports has several items to choose from. We encourage you to additionally maximize your visibility with ankle or arm bands. Aid Station locations are noted below. Water and Hammer HEED (Electrolyte Drink- various flavors) will be available in cups, though aid stations will be happy to refill your water bottle, should you chose to carry one. Every aid station will have water and Hammer Heed energy drink. Aid stations designated "ultra" aid stations will be provisioned additionally with Hammer Gel and other provisions. Aid station locations are dictated by their minimum impact on Red Rock Canyon NCA. Please do your part in preserving our public lands by using the trash bins provided. No littering will be tolerated! Use of personal water bottles is highly encouraged to reduce waste. Thank you for your cooperation. Portable toilets will be available at the start/ finish line and at the miles on course noted below. 5K Aid Station Locations: Miles 0.7 and 2.4. 10K Aid Station Locations: Miles 0.7, 2.2 (toilet), 4.0 (toilet), and 5.5. 1/2 Marathon Aid Station Locations: Miles 0.7, 2.2 (toilet), 3.5, 4.5 (toilet access only, no aid), 6.3 (ultra), 6.8 (ultra), 8.6 (toilet access only, no aid), 9.6, 10.9 (toilet), and 12.4. *Calico Racing reserves the right to make modifications to the above aid stations as needed and appropriate. SCHEDULE, slight changes may be made to these times. ** RACE DAY PACKET PICK UP. PLEASE LEAVE ENOUGH TIME TO GET CHECKED IN. 4:15pm: Contracted STRIP BUS departure from Ballys for those that have purchased the STRIP bus ticket. Pick up location: Bally's Hotel and Casino at 3645 Las Vegas Blvd, using the FLAMINGO ROAD side for pick up. 4:30pm: Buses will begin departing the pick up area to transport runners to the start line. Main FREE location is at (2019 location to be confirmed) WEST CAREER AND TECHNICAL ACADEMY located at 11945 W Charleston Blvd, Las Vegas, NV 89135. Buses will run on a rotation. Buses load on the EAST side of the building. CLICK HERE FOR MAP. PACKET PICK UP AT THE START LINE ON RACE DAY, located right where the bus will drop you off. 5:45pm: 1/2 Marathon start time! Awards will be handed out at the finish line as runners finish. ~6:45pm: Buses will begin to run on a rotation to return runners to their cars at the MAIN FREE parking. 7pm: Red Rock Scenic Drive closes to casual park users, though late exit permit holders may still be on the road. 7:30pm: Bus back to the STRIP departs the finish line. Approx. 8:30pm: Bus back to the STRIP departs the finish line. Approx. 9:20pm: Bus back to the STRIP departs the finish line. Approx. 9:20pm: Last bus returns to the main parking area. ** Please note that bus times after the race are approximate. It is my high priority to get you where you need to go in a timely fashion, but your cooperation is appreciated as we tend to everyone's needs. Finish line refreshments will be available and awards will be handed out at the finish line area for registered athletes only. Spectators should note that there are no concessions at the finish line and should come prepared to be self sufficient with food and water. 1- FREE: This area is closest to Red Rock Canyon (approximately 30 minutes drive from the Strip). The MAIN FREE parking and busing is from (2019 location to be confirmed) WEST CAREER AND TECHNICAL ACADEMY located at 11945 W Charleston Blvd, Las Vegas, NV 89135. This area is conveniently located on Charleston Blvd just west of the I-215. We will load on the EAST side of the building. CLICK HERE FOR MAP. The one way bus ride will take ~10 minutes. 2- STRIP BUS: For those that purchased a Strip bus ticket only. Bally's Hotel and Casino at 3645 Las Vegas Blvd, using the FLAMINGO ROAD side for pick up. Your cooperation is appreciated and expected. Spectators are an important part of any race- they give you that boost of energy when you need it most, encourage you when you're feeling low, and can pep you up to fly into the finish line! Calico Racing wants you and your spectators to have a fun and safe experience, while minimizing the congestion for casual park users. I ask that you PLEASE have your spectators adhere to these offered services, as this is CRUCIAL in determining the renewal of my permit for next year. THERE IS NO RACE SPECTATOR PARKING AT RED ROCK CANYON! 1- Bus transportation FROM THE STRIP is available for runners and spectators for $30 rt/pp. Pick up location is Bally's Hotel and Casino at 3645 Las Vegas Blvd, using the FLAMINGO ROAD side. Race day bus DEPARTS at 4:15pm for all runners and spectators; Post race STRIP return to the same location is at APPROX 7:30pm, 8:30pm, and 9:20pm. Slight changes may be made to these times. 2- Main FREE location is at (2019 location to be confirmed) WEST CAREER AND TECHNICAL ACADEMY located at 11945 W Charleston Blvd, Las Vegas, NV 89135; Buses will run on a rotation to get everyone to their start lines. When loading the buses on race day, 1/2 marathoners (5:45pm start), then 10K (6pm start), then 5K runners (6:05pm start), then spectators will have priority when boarding the buses. Please have your spectators be respectful of your fellow runners when boarding the buses and use of port-a-potties. 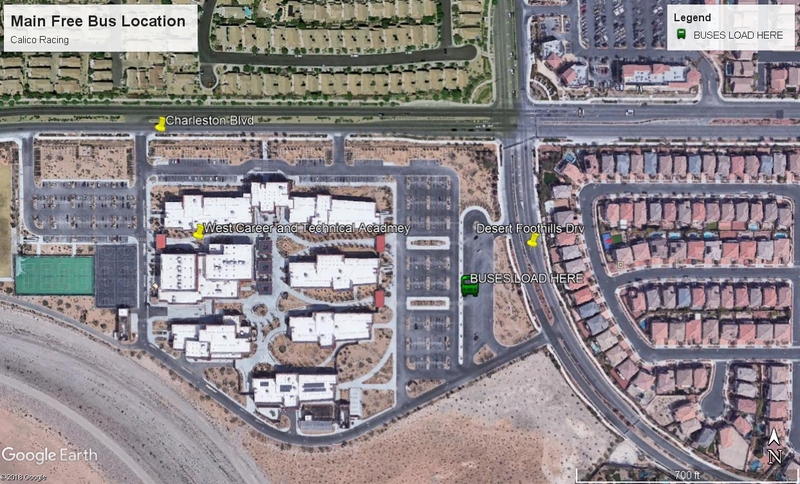 NO spectators will be transported TO the race from the main pick up area at (2019 location to be confirmed) WEST CAREER AND TECHNICAL ACADEMY located at 11945 W Charleston Blvd, Las Vegas, NV 89135 until all runners have been transported. You may have your spectator drop you off at your start line, then have them proceed to the busing area. This will alleviate demand on the buses and ensure smooth sailing on race day. I ask that spectators allow ALL runners be transported first for an on time race. I anticipate all runners having been transported to their start lines by 5:55pm, at which time spectators will start boarding the bus. As with runners, spectators will be bused back to their cars after the race. Buses will run on a rotation when demand dictates. *Also note* There are no concessions at the park, and race provided food and beverages are for registered athletes only. Spectators should come prepared to be self sufficient with food and water. PLEASE NOTE: This service is FREE to spectators. Calico Racing is paying for their entry into the fee area park. YES- this means it is very important that you please make use of this service. The only way I will knowingly give the go ahead for a spectator to drive their own vehicle is if they are willing to volunteer for a portion of the race. Contact me at calicoracing@hotmail.com for details. Thank you for your cooperation! * All finishers get medals. ** Awards will be something inspired by nature and/or the surrounding area and the theme of the race. Overall Male and Female winners for each event (Half Marathon, 10K, and 5K) go 3 deep. Overall winners will be taken out of the running for age group awards. Camping is available in a designated camp ground near Red Rock Canyon, roughly 2 miles from the Red Rock Canyon Scenic Drive entrance. The campgrounds are accessed off highway 159 (Charleston) and Moenkopi Road. Camping is available on a first come first served basis and offers basic bathroom facilities (I don't think showers are available). 2 tents and 2 vehicles per site max. Exact change only for self serve check in. A camp host is on site. Red Rock Canyon Campground single sites to move to national reservation system LAS VEGAS – Visitors may reserve single campground sites at Red Rock Canyon Campground online or by phone for visits starting in 2019. Beginning October 15, 2018, Red Rock Canyon Campsite reservations for camping dates from January 1, 2019, and beyond can be made at http://www.recreation.gov, or by calling the national reservation hotline 1-877-444-677. Reservations can be made up to six months in advance but not less than 48 hours of the desired arrival date. Camping rates have not changed and are $20 per night for the standard and RV sites, $10 for the walk-to sites, and $60 for the group sites. Currently, only the seven large group campsites at Red Rock Canyon Campground are on the online reservation system; however, 66 of the 80 single campsites will be available on the system for camping starting January 1, 2019. The remaining 14 campsites will be offered on a first-come first-served basis. *Red Rock Canyon is roughly 30 minutes from downtown and "the strip" and within 10- 45 minutes of most residential areas of the valley. (2019 location to be confirmed) WEST CAREER AND TECHNICAL ACADEMY located at 11945 W Charleston Blvd, Las Vegas, NV 89135. This area is conveniently located on Charleston Blvd just west of the I-215. The one way bus ride will take ~10 minutes. ONLY those runners and spectators who have purchased the STRIP bus ticket will use this location! This pick up location is at Bally's Hotel and Casino located at 3645 Las Vegas Blvd, Las Vegas, NV 89109. Use the FLAMINGO ROAD side of the property to board the bus. Look for the contracted bus. This location is within walking distance to many Strip hotels or a few dollars taxi ride. If you are standing on the corner of Las Vegas Blvd and Flamingo Road, with Bally's Hotel on your right side, turn RIGHT and walk about 200' along Flamingo Road. There is an incline in the sidewalk to the bus loading area. From the Las Vegas Valley: I-215 beltway to Charleston Blvd. Exit WEST and continue on Charleston/ 159 heading west. After ~5 miles you will pass the toll entrance on your right. Continue straight another 2 miles along Highway 159. You will see a dirt lot at the exit of the scenic drive- this is the start/ finish line. From Southern California: I-15 North to I-215 beltway WEST. Exit onto Charleston Blvd, heading WEST. Continue on Charleston/ 159 heading west. After ~5 miles you will pass the toll entrance on your right. Continue straight another 2 miles along Highway 159. You will see a dirt lot at the exit of the scenic drive- this is the start/ finish line. From Arizona: Over Hoover Dam Bypass Bridge continue on 93 North toward Henderson and Las Vegas. Exit onto Lake Mead Parkway (NOT into Lake Mead N.R.A) heading WEST which later becomes I-215 beltway. Continue WEST and exit onto Charleston Blvd, heading west. After ~5 miles you will pass the toll entrance on your right. Continue straight another 2 miles along Highway 159. You will see a dirt lot at the exit of the scenic drive- this is the start/ finish line. The STRIP Bus Option: For those preferring to stay on The Las Vegas STRIP, contracted bus service is available! The cost is $30 round trip per person and includes race day packet pick up eligibility. You may also purchase SPECTATOR bus tickets for the same price. There are no "tickets"- but the driver will have a list of names of those who've paid for this service. Race day we will be awaiting your arrival at the start line with your packets. The pick up location is at Bally's Hotel and Casino located at 3645 Las Vegas Blvd, Las Vegas, NV 89109. Use the FLAMINGO ROAD side of the property to board the bus. Look for the contracted bus. This location is within walking distance to many Strip hotels or a few dollars taxi ride. ***If you are standing on the corner of Las Vegas Blvd and Flamingo, with Bally's Hotel on your right side, turn RIGHT and walk about 200' along Flamingo Road. There is an incline in the sidewalk to the bus loading area. The one way trip takes about 30-45 minutes via bus depending on traffic. RETURN DEPARTURES back to the Strip from the finish line: 7:30pm, 8:30pm, and 9:20pm APPROX. **This information is subject to slight changes, so please check back as the race gets closer *** If you would like to purchase a bus ticket, you can do so when you register online, or you can select that option on your mail in entry form. There will be a tarp laid out at the start/ finish line for you to leave your gear bags. Please use your own bag and label it with your name. Please note these are not checked nor guarded, so no valuables please. Please also remember to retrieve your bags after the race, as bags will not be mailed after the race. Please CLICK HERE to review the Desert Tortoise Information. We are no longer required to have athletes sign the previous Desert Tortoise Waiver, but you will be required to abide by this information during the race. Your cooperation is appreciated and expected.